Hand-marbled in Italy, this acid-free paper features a stunning, one-of-a-kind array of vibrant colors that will add a distinguishing touch to any art or home decor project. The Stone design features dark blue, light purple and tan droplets spread across the page making a granite pattern. Infuse a one-of-a-kind piece of art into your project with beautiful, hand-made Italian Marbled Paper. Designed and crafted by second generation marbling artist Laura Berretti in Florence Italy, the intricate marble designs are applied by hand to each and every sheet. Laura uses an array of rich, vibrant colors in her stunning designs that add eye-catching touch to any art, bookbinding or home décor project. The materials used in the marbling process are carefully chosen by Laura for their non-toxic properties to respect the environment. High-quality, acid-free wood pulp paper provides the base sheet to which the beautiful color palette and patterns are applied by hand. The Stone pattern features navy blue, lavender, and tan-colored droplets, forming a pattern remarkably similar to granite. 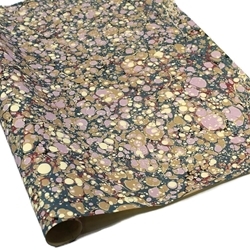 This Italian Marbled Paper is 120 GSM and is available in sizes 6" x 6", 8.5" x 11" and 19.5” x 27”.